In 2016, 1,378 volunteers took part in making The Genworth Virginia 10 Miler a success. The Genworth Virginia 10 Miler has become known for a tradition; “where hospitality meets the road”. 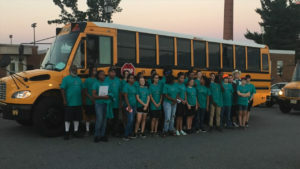 Because of our volunteers, we continue to experience unprecedented growth with a reputation for excellence. This success would not be possible without the contribution of so many amazing volunteers! Genworth, Centra, Bank of The James, Areva, Rehab Associates of Central Virginia, Randolph College, Lynchburg College, Liberty University, Lynchburg Fire & Rescue, Lynchburg Police Department, Amateur Radio Club, CHAP’s, Girls on The Run, Miriam’s House, Amazement Square, plus many more churches, organizations, and individuals. If you are part of an organization that would like to volunteer, please e-mail us. Donald G. Dougherty, SMSgt (Ret), M.S., M.Ed. 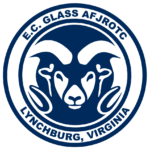 I lead the E. C. Glass HS Air Force JROTC by providing road guards for the race — from EC Glass HS to the Farm Basket. 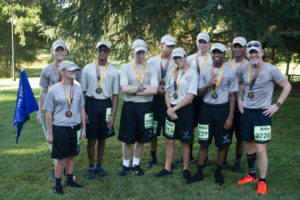 We also have a running team that participates in the race. What is your favorite part about race day? To be able to give back to our community, and cheering on the racers as they accomplish goals. We are always proud to serve our community and our nation with patriotism, as we continue to uphold the Air Force Core Values of Integrity First, Service Before Self, and Excellence in All We Do!